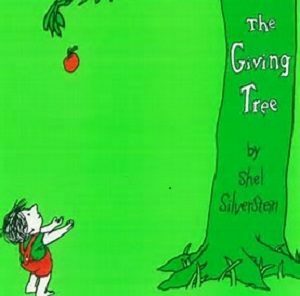 The Giving tree is a children’s picture book written by Shel Silverstein. This is a story of the relationship between an apple tree and a boy. When the boy was young he and the tree became very good friends. The tree always give the boy what he needs, such as vines to swing from, shade to sit in, apples to eat, branches to build a house, a trunk to build a boat and a stump to sit on. As the boy got older, the tree gave more as the boy wanted more. As the tree loves the boy a greatly, she gives him everything she can to make him happy. The Giving Tree represents in great depth of unconditional love, generosity and selfless . Inspired by this famous poem, we have designated a tree of our own as a ” Giving Tree”. We are committed to donating all the apples from this tree in our orchard to those who are in need residing in our community for years to come. We invite/welcome students along with community members to volunteer and invest their time each year during the harvest season. During this time, everyone will pick apples from this tree to deliver to organizations which serve and give to our community.